Odisha Youth Congress President Rajat Choudhary has denied the claim of his resignation made by the senior Congress leader Lulu Mohapatra yesterday. Neither I have resigned nor spoken to the senior leader on my resignation, Rajat Choudhary said to media persons. 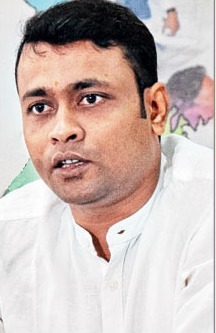 Odisha Pradesh Congress Committee (OPCC) Chief Prasad Harichandan have also informed that he has no knowledge of Rajat Choudhary resigning from the post of president of the state unit of the Youth Congress. Mohapatra has announced yesterday that he has received the resignation from Rajat and said that the Youth Congress President not involved in the chit fund scam but is resigning on moral grounds.